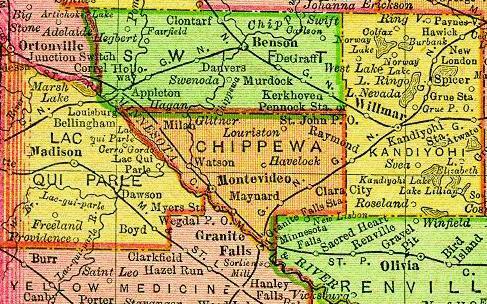 Northwest of Renville County, also along the Minnesota River, is Chippewa County (pop. 12,441). Michigan and Wisconsin also have Chippewa counties. Montevideo (pop. 5,383), the county seat, was apparently named for the capital of Uruguay. The cities are Sister Cities, and Montevideo (Minn.) celebrates Fiesta Days each June. The Montevideo in South America is somewhat larger. Downtown Montevideo has a statue of Jose Artigas, leader of Uruguayan independence. The former Milwaukee Road depot in Montevideo is now the Milwaukee Road Heritage Center. The 2005 movie “Sweet Land,” set in rural Minnesota in the 1920s, was filmed in the Montevideo area. The town of Watson (pop. 205) is known as “Goose Capital of the USA” because of the many Canada geese that inhabit nearby Lac qui Parle (“lake that speaks”) State Park every fall. Lac qui Parle is on the Minnesota River. This entry was posted in Minnesota and tagged Chippewa County, Jose Artigas, Lac qui Parle State Park, Milwaukee Road Heritage Center, Montevideo, Sweet Land, Watson. I love that Montevideo connection. Never would have expected it.